NETWORK FINALS: The WINTER OLYMPICS adjusted up by 0.3. Elsewhere, PREMIER BOXING and the 8PM MACGYVER rerun lost 0.1 in final numbers, but the 9PM NCIS: NEW ORLEANS rerun gained the same. CABLE HIGHLIGHTS: TNT’s NBA ALL-STAR weekend coverage continued to pay off with a dominant 2.10, with 0.76 for the PLAYERS ONLY special that preceded it, and 0.57 for the “sneak peek” of the TBS series FINAL SPACE that will officially premiere next week. NBC Sports Net’s afternoon WINTER OLYMPICS coverage was at 0.76. A&E’s LIVE PD returned at 0.73. ESPN’s COLLEGE BASKETBALL day was at 0.47/0.36/0.34/0.27. 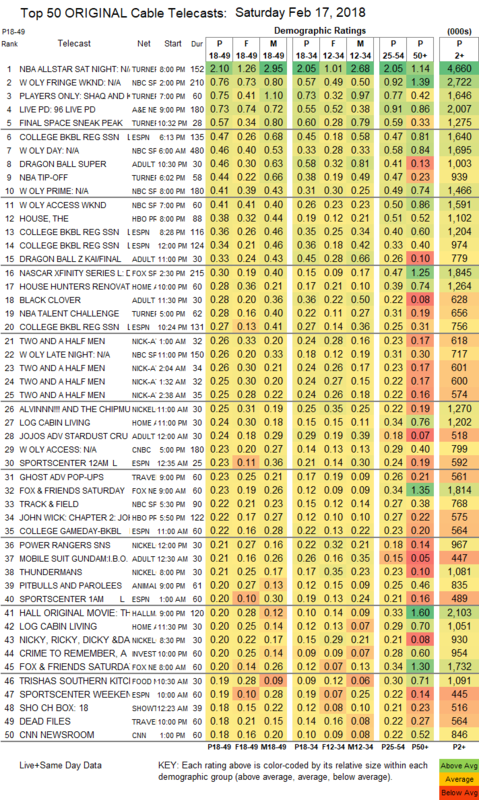 Adult Swim’s late-night line-up performed as follows: DRAGON BALL at 0.46/0.33 compared to last week’s 0.47/0.38, BLACK CLOVER down 0.02 to 0.28, JOJO’S BIZARRE ADVENTURES down 0.02 to 0.24, MOBILE SUIT GUNDAM down 0.03 to 0.21/447K, HUNTER X HUNTER down 0.02 to 0.20/440K, NARUTO down 0.01 to 0.20/457K, OUTLAW STAR down 0.01 to 0.16/351K, SPACE DANDY down 0.05 to 0.12/305K, COWBOY BEBOP down 0.06 to 0.12/304K, and GHOST IN THE SHELL down 0.04 to 0.12/293K. Fox Sports 1’s NASCAR race was at 0.30. HGTV’s HOUSE HUNTERS RENOVATIONS gained 0.02 to 0.28. ID’s CRIME TO REMEMBER fell 0.05 to 0.20. On Food Network, TRISHA’S SOUTHERN KITCHEN ticked up to 0.19, KITCHEN AT FN lost 0.02 to 0.16, VALERIE’S HOME COOKING held at 0.14, and PIONEER WOMAN dropped 0.08 to 0.13. 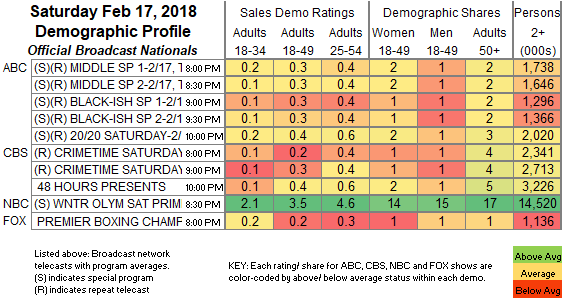 BBCAmerica’s BLUE PLANET II and its follow-up were at 0.14/0.12 compared to last week’s 0.15/0.13. USA’s FALLING WATER was steady at 0.08.